I liked the product as it had a neat clear face and as the person who the watch was bought for has very small wrists, I thought a leather strap would be better than a bracelet type and easier to adjust. Comfortable, fits a small wrist. Unique shape and looks timeless. 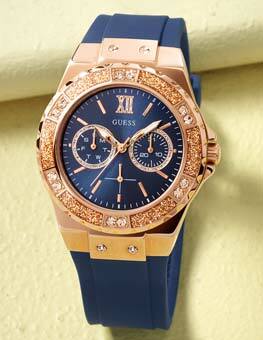 Ive been searching for a new watch thats ok for me for 3 years now.! I saw this watch the first time I looked on the Watch Shop website and liked it straight away, read the description and a review and ordered it straight away and was more than happy when it arrived fast in the post. Its easy to read the time, no squinting, yet petite at the same time, the face has 8 corners and they are smooth so cant catch/bang myself on it by mistake. I have slim wrists so the petite strap is complementary, great, it doesnt have a second hand that ticks loudly which is ideal so can put it next to my bed to read when wanted overnight. Its fine to wear at work and cool enough for evenings and posher things too, all times of the year. Bargain, it costs less than other ones Ive tried on but had to return as they didnt match up to the information online. Thank you Watch Shop! 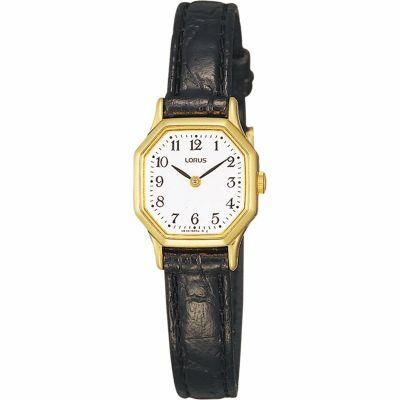 This watch is tiny and delicate it suits people with small wrists perfectly! 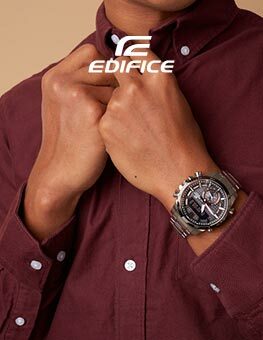 Theres nothing I dont like about this watch, its perfect for what I was looking for- a practical watch that was inexpensive, fashionable and functional. I like the simplicity of its design- my favourite feature being the dial face which is octagonal in shape. Asides from being rather unusual, its still quite retro and looks pretty stylish! I would say the dial is quite narrow though, so if you are looking for a larger dial face maybe check out the round dial selection, they have some similar ones in Lorus round dial, black strap which are equally nice and I also considered? 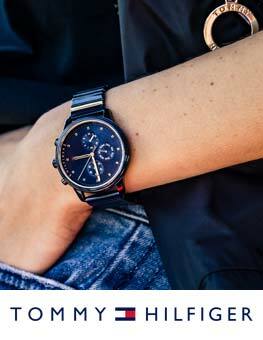 The black leather strap is slim and is accompanied by a nice silver buckle. Having smaller wrists I thought Id have to get an extra hole added but that isnt necessary...I can wear the watch tighter or looser. The description of the watch and image says the dial has a white face- it has, but it almost has a metallic sheen to it which makes the numbers stand out even more. Very nice and fits the purpose. This is a good watch for everyday use, particularly for work. It looks more expensive than what it was and its made by a reliable brand Seiko that also manufacture Lorus and Pulsar watches so I hope it will be an investment watch that will last rather than a cheaper watch I will get bored of...and decide not to replace the battery of! 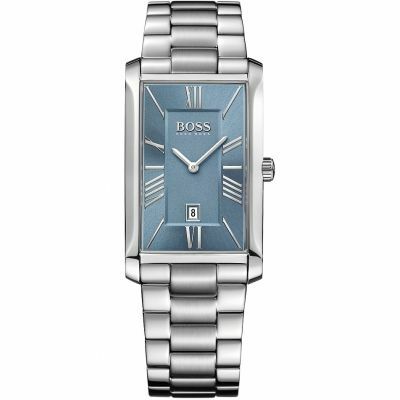 I would recommend this watch to petite women with smaller wrists that are looking for something simple, yet elegant. Check the measurements before you purchase it. Website easy to navigate and watches easy to find. This company has an excellent quick service with a very good price. 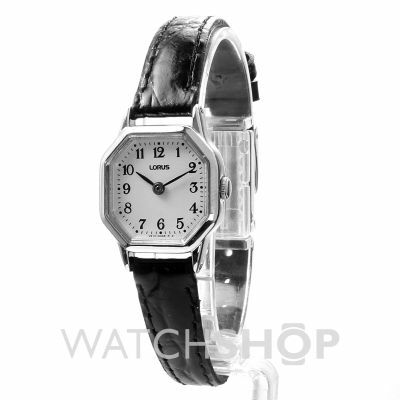 This watch has quite a small strap and would only suit someone with a small wrist. It is nice and easy to read which is why I bought it. A lovely watch which I am very pleased with. Watch Shop is een geautoriseerde Lorus verkoper. 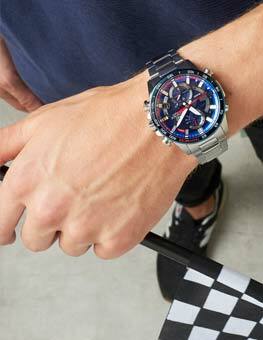 Meld u nu aan om e-mail updates te ontvangen wanneer nieuwe stijlen van Lorus worden toegevoegd aan Watch Shop!